deCOALonize has written an article for, Perspectives, a UNEP publication series that presents views from Major Groups and Stakeholders of Civil Society or about issues that are relevant for them. PERSPECTIVES is coordinated by UNEP’s Major Groups and Stakeholders Branch. 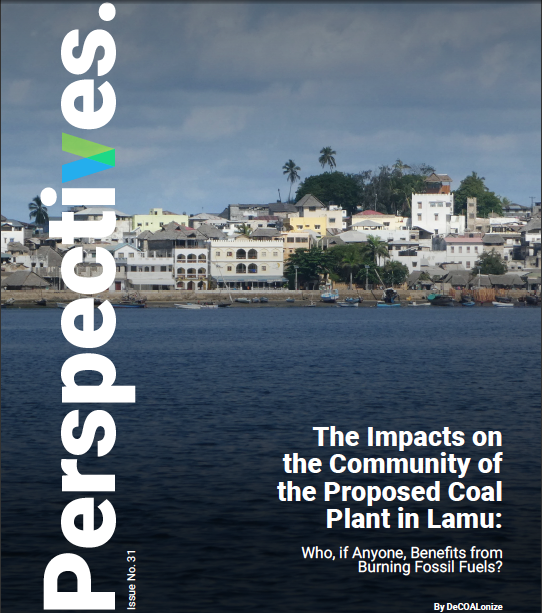 “The Impacts on the Community of the Proposed Coal Plant in Lamu” by DeCOALonize introduces the plan to construct Kenya’s first coal-fired power plant and explains how it may impact the livelihoods, health and environment of local communities on the Kenyan coast. Click image below to download full article. Previous post: Climate change cannot be solved by governments alone. How can the private sector help?